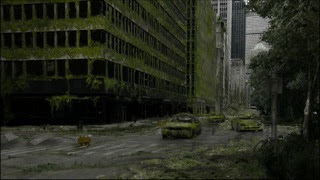 Unregistered humans cling to the fringe, scavenging for survival. 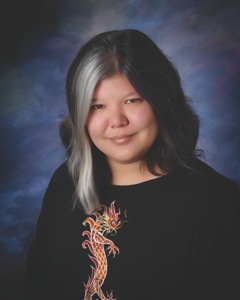 Allison Sekemoto and her fellow Unregistereds are hunted, not only by vampires, but by rabids, the unholy result of Red Lung-infected vampires feeding on unwary humans. One night, Allie is attacked by a pack of rabids, saved by an unlikely hero...and turned vampire. Just when you thought vampires were so 2008, along comes this story of a girl turned vampire living in a destroyed city run by vampires and ravaged by rabids (think zombies). This paranormal has a more dystopian feel. A virtually dead city rampant with gangs of children fighting to survive let us know that we are not in modern day times. The Red Lung virus has wiped out most of humanity and left everyone to the vampires. Allison is a survivor, and as a human, she fought every day of her life to live to see sunlight. As a vampire, she fights, kills, runs, hides, lies her way to see another night. Allison is an easy character to like. She is loyal, almost to a fault, and her quit wit and no-nonsense attitude won me over time and time again. After she leaves the city, on the run really, and heads towards the Fringe, things get a little complicated when she runs into a band of humans who are in search of Eden. Yes, that Eden. She decides to roll the dice and travel with the group even though she is terrified of making another mistake....letting her hunger get the best of her. This group of humans tries Allison's patience. There are members of the group that do not trust her and think she is hiding something. Allison feels the same way about the leader of the group, Jeb. His authoritarian ways don't fly with Allison and soon she is searching for answers in Zeke, his adopted son. Allison continues to struggle with being a vampire among a group of humans and her feelings for Zeke aren't helping the situation. Alllison uncovers some truths and soon has to decide exactly what and where her Eden is. Smart writing with plot twists and strong dynamic characters make this vampire story new again! The Fringe is a massive concrete jungle; canyons of broken glass and rusting steel, skeletal giants choked by vines, rot and corrosion. Rusted shells of what were once cars are scattered about the streets, their rotted frames wrapped in vegetation. Trees, roots and vines push up through sidewalks and even rooftops, splitting pavement and steel, as nature slowly claims the city for its own. In recent years, a few of the looming skyscrapers finally succumbed to time and decay, tumbling to the ground in a roar of dust and cement and breaking glass, killing everyone unlucky enough to be around it when it happened. It was a fact of life anymore. Enter any building nowadays, and you could hear it creaking and groaning above your head, maybe decades away from collapse, or maybe only seconds. The city is falling apart. Everyone in the Fringe knows it, but you can’t think about that. No use in worrying about what you can’t change. 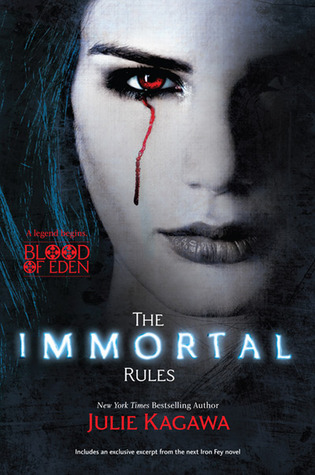 Please visit http://www.sithereandread.com/ for the next stop on The Immortal Rules blog tour. Complete tour information and details about the AMAZING blog tour grand prize of a Kindle & a custom made, one of a kind, Immortal Rules Kindle case HERE. Big thank you to Harlequin Teen for offering up a SIGNED hardcover copy to one lucky US/CAN winner! Thank you to Media Masters Publicity for the tour! Must be a follower and 13yo+. Good luck!